I needed a thank you card, so I decided that's what I would make; all products are SU except for the Doodlebug Sugar-coated Brad! I hand-stitched the Old Olive twill "stem"; the leaves are Certainly Celery Prints DP that I cut into leaf shapes, folded in half and put through my crimper. The pot was cut from Almost Amethyst cardstock, stamped repeatedly with "thanks" from EFP and sponged on the edges. I curled it a little to give it some shape and attached it with two fat Pop-up Glue Dots. The flower & sentiment are from Enjoy Every Moment. I used my Stamp-a-ma-Jig to place the words one of top of the other. I was trying to do an "out-of-the-box" Christmas card. The fun thing about this card is all the glitter, which is difficult to see. The branch is stamped in Craft ink and heat embossed with Iridescent Ice EP; around the edges of the Certainly Celery cardstock is a line of DD glitter as well; and the Sugar-coated Brads are glittery too. This is all from a retiring SU set called Peaceful Wishes...one I am very sad to see go!!! And since I am leaving for convention this afternoon, a reminder that I probably won't be posting anything until I return, unless someone in my room brings a laptop!! Hold down the fort while we're gone!!! 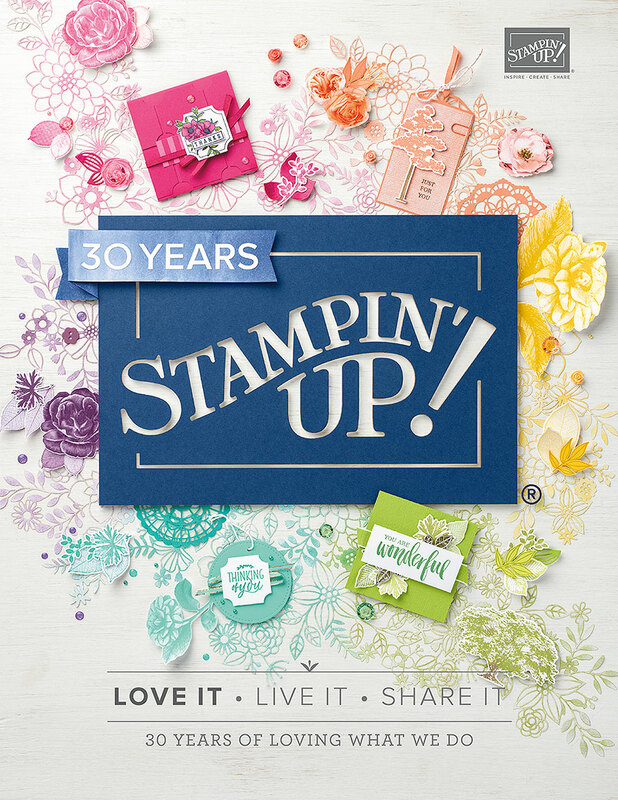 One of the first emails I received today was a little woo-hoo from a fellow swapper that I had a card on Stampin' Up! 's Stamper's Showcase. That is SU's version of a gallery where demos send in their samples & sometimes they get chosen to be displayed! I hadn't ever posted it in case they did choose it, but it was a while back so I had forgotten about it. Since I am busy getting ready for convention, this is a perfect time to show you the card! This card uses the retiring In Color Soft Sky and All Through the Year set, as well as Simply Said for the sentiment. The flowers are stamped on Kraft in White Craft ink; the centers are punched with the Anyhere Punch tool, and the stems were pierced with the punch, both found in the Tool Kit. I finished it with a simple Soft Sky ribbon. Remember that tomorrow is Wednesday, the day of our Color Throwdown Challenge! Since I will be leaving tomorrow afternoon for convention, I won't have any more postings after that until I return home on Sunday! So be sure to stop back tomorrow to see what the CTD girls have come up with ! Have a great day! Aren't they wonderful? And there were some stamped images inside Denise's. I should have photographed the insides as well, both are just as nice inside as out! Thanks girls! These two cards are from fellow NMBSers! You can see that link at the side as well! Thank you so much, Vicki & Lisa! What a nice surprise to get these beauties in the mail!!! This one is from Dana (Life Is Good). This card is just stunning in all the detail; again, I should have photographed the inside (I'm tired!) so you'll have to take my word for it that it, too, is just as pretty inside as out. I love the herb images she's used, along with the Canvas background & eyelets. Right up my alley! Thanks, Dana! And these two cards are from a couple of my customers, Linda, Ginger, and Ginger's daughter Emily. Linda used some sweet little images that are so precious; Ginger and Emily's card was actually a thank-you, and they used the faux diamond-dust technique that made those beautiful colors really shine. It was a lovely birthday, even if I didn't get to stamp (yet!). I had a surprise cake at a picnic last night & my daughter got me a beautiful necklace, a pair of shoes, a gorgeous violet, and a new computer mousepad. John & I went out to dinner Friday, and took friends out on our sailboat Saturday, I got several other nice cards in the mail as well, so it was a really nice weekend. Thanks to all of you! The tree is stamped with the small snowflake from The Snowflake Spot; I read about this on SCS somewhere (sorry, I don't remember where) and I played around with the image until I came up with this design. Stamp three at the bottom, close together; then two on top; then one. Fill in with ink & dauber. Add punched star on top and dot each snowflake with gold ink from Gold Painty. Tree trunk is punchout from Word Window Punch, cut in half. These were all fun, fairly simple cards--of course you can't see the glitter, the best part! I have a busy day, so off I go! If anyone needs recipes, just let me know! Thanks for visiting! I had a couple different ideas for this, but ran out of time, so went with my first sample using the hydrangea and sentiment from Inque Boutique's Fluttering By, Butterfly. (Plus I have NO rose stamps!!) I used Craft Rose Red and Craft Sage Shadow to stamp the main image, then filled in with Classic Regal Rose & Sage Shadow inks with an aquapainter. I used the Craft ink because, once dry, it won't bleed. The sage panel is stamped in Soft Sage with the Linen background stamp, and the white card base is stamped off with the flourish from Baroque Motifs, also in Sage Shadow. I added an old piece of lace and pearl button from my stash for the "vintage" look of the dress. How coincidental that my dresser scarf mimics the flourishes!!! This looks rather vanilla in the photo, but it really is white! Thanks for visiting!! It seems I am using a lot of pink lately! This card uses the same image that I used for Kristina's challenge last week, but the full image. It is on shimmery white paper so it makes it quite easy to watercolor. The Regal Rose background has been stamped with Tres Chic, scalloped, and I added a little border from Inque Boutique's Stitch Fun. Can you tell I love that set??? I don't usually add a bow to my cards as I think it makes it too bulky, but I thought a big organdy bow would like nice here. Black is not a color I would normally associate with a baby card, but it seemed to work! Thanks for this idea, Denise! And thanks for visiting. I am going to try to post Kristina Werner's challenge today, which is almost the same colors as my first Color Throwdown Challenge!!! But I am prepping for my Christmas Card Stamp Camp, so I don't know if I'll have time or not!!! 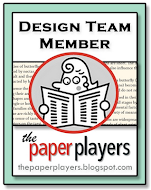 This card uses a layout from Jen's Sketch for You to Try. Main stamp image is from Lockhart; the buttons & sewing images are from Inque Boutique's Stitch Fun. Now let's see what you come up with! Well, I guess being a bad blogger might fit in with Dirty Girls! 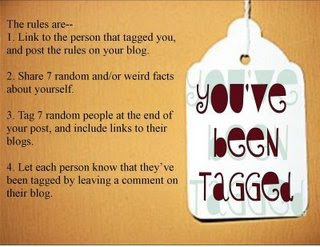 I was tagged by Mary Jo at Techno Stamper last week and have not posted it! So sorry! Since I was just tagged a little while ago, and there are soooooo many wonderful blogs out there, I am going to consider you all tagged! If anyone wants to post a little something about themselves, please feel free!!! And please check out Mary Jo's blog here because she has some awesome samples! Thanks Mary Jo!!! Thanks for visiting! Remember, tomorrow is the Color Throwdown Challenge, and Broni is our hostess! You can click on the link on the sidebar for more information! I just love this little stamp from 100 Proof Press! They have the coolest vintage images. My thank you card stash is quite low, so I have been concentrating on making more, but I really need to get some samples made with my new SU stuff! I had this already stamped, so I just colored it in and mounted and embellished it. The image is stamped on shimmery white cardstock; card is Barely Banana with some Dollar Store dp. The sentiment is from My Favorite Things, punched with my SU round punch. Added ribbon and dew drops and it's in the mail already! TFL! I needed some quick thank-you cards, and I also wanted to participate in Our Creative Corner's challenge for this week, which is to use dry embossing. I already had received these gorgeous embossed pieces from my friend Billie, along with some stamped images, so it was quick & easy to put them together. I like this clean & simple style! The butterfly image is from Inque Boutique's Flutter By, Butterfly, stamped in Sage Shadow; the sentiment is SU's All Holidays, stamped in Close to Cocoa. The ribbon is a suede RAK from Tammy. I also mounted the image on a piece of Close to Cocoa cardstock that I split in half so that it resembled suede. Both cards are PTI's Aqua Mist. The colors really match much better IRL! Thanks for visiting! This card used Peaceful Wishes and Sahara Sand, Naturals White, Handsome Hunter & Real Red cardstock. The pinecone was glittery, although you probably can't see it here. This card was a simple easy birthday card, great for a guy. It used Polka Dots & Paisley, Little Pieces, Amazing to Zany and All Through the Year, along with Purely Pomegranate & Blue Bayou cardstock, both retiring In Colors. I gave away some door prizes, had a stamp sale of some older retired sets, and we all ate some goodies! The batter will be runny. Put cupcake papers in muffin tins and pour batter into papers. Drop a teaspoon of cream cheese mixture in the center of each cupcake. Bake 30-35 minutes at 350 degrees. This will make 16-18 cupcakes. The recipe says they are moist and don't need icing! I agree! This recipe is from Tole World, April 1983. Hopefully the afternoon will let me stamp a bit--I have some sewing and alterations to do, then we'll see! Have a great Saturday! I am prepping for my open house tonight, so I don't really have anything new to show you, but I did get some nice things in my mail this week! This dazzling beauty is from my upline, Pennie. She is always a source of inspiration for me, and can be counted on for some really cute ideas. This card has been watercolored, and the "celebrate" is silver embossed--ooh la la! The best part about this card was what was inside--a nice big fat gift certificate! Thanks Pennie!! This is from my fellow stamper friend, Shawn! This girl has the most amazing style; I keep trying to convince her to start a blog, and I think she will be soon! So watch out, because she will rock the stampin' world! Although this is hard to tell, the card is Almost Amethyst and the center of the flower is Perfect Plum. Cute DP--thanks, Shawn!!! How would you like to open a big box with all these goodies inside? I won Dawn's blog candy, and my eyes popped out when I saw all this stuff! There is gorgeous Scenic Route DP, cardstock, flowers, CUTE buttons, CUTE ribbon & jumbo rickrack, a tin & scrapbook thingie inside, glitter, diecut chipboard and chipboard coasters. I just don't know what to use first, it is all GORGEOUS. And this is the first time I have ever won any blog candy, isn't it fabulous! I am so blessed! Thank you so much Dawn!!! 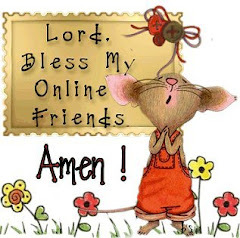 I hope all of you have a wonderful weekend. I am STILL chopping, cutting, cooking zucchini....now the peppers are coming, and seriously, I think we have about 100 spaghetti squash growing. We have never grown it before so we had no idea it would take over like it has!!! Hopefully it will keep for a while so we can eat it in the fall & winter! Hey! Check out this website and you can win this quilt! I am thinking I will be one of many who uses this image! Anyway, the details are pretty simple: images are stamped in Going Gray and watercolored very carefully as the GG is not waterproof. Mounted on Nestability scallops & circles, popped up on dimensionals. I am very excited about the scallop punch that I just got from my SU order--it is very easy to use and looks great! The little stitched border at the top is even more exciting - it is from the Inque Boutique stamp set Stitch Fun. If you haven't seen these, check out their stuff at The Purple Turtle. They combine the best of rubber stamps with the positioning capability of clear stamps. JUST AWESOME, I want to play all day with them! Ribbon is just some double-sided satin from ACM. Thanks for looking, I'm off to clean! I broke into some of the yummy DP I bought on my shopping trip to Lancaster, and used a couple of retired SU images for my focal point. The sunflowers were painted with Barely Banana and Pumpkin Pie ink, and the whole image was overstamped with Sanded in Barely Banana, and Linen with Sahara Sand to give it a shabby, grungy feel. I also distressed the edges with my SU tool. I wish you could feel the suede ribbon, a RAK from Tammy (thanks again! ), it just adds so much to the textures in the card; I finished it with an old button from my stash. So lets see what you come up with! Post your take on this color challenge in the comments screen on the Color Throwdown blog and link it to your blog if you have one. And if you don't have these colors, feel free to substitute something close! If you'd like to link your creation at SCS, use "CTD2" in your posting! This cute little bag has been making its appearance on many a blog, so when I saw it again on Renee's, I decided to finally give it a try! Her posting is from July 9 and she also has a link to a tutorial. I found mine at Diana Gibbs' blog, so that is the one I used. I realized when I made my first one, I used exactly the same paper as hers!! So I kind of threw another one together today; this is a little shorter in height because I used a scrap piece of DP that I had in my stash. I did not scallop the bottom edge, but stamped some of the elements from Wanted, added some ribbon & buckle from HPH, and tied it with the same ribbon. (In this light, I guess that ribbon doesn't match very well! Oh well!) I did not add any embellishments to the front of the bag since the DP's design was centered so nicely! Gee, how did that happen? I can see where there could be lots & lots of possibilities for these little bags! This one will be a door prize at my upcoming Retirement Stampin'Up! party! I guess I should put something inside though! LOL! My next one will be a little more embellished--that is the fun part, don't you think!? It is quite easy, why don't you give it a try? Thanks for visiting....remember that tomorrow is COLOR THROWDOWN CHALLENGE Wednesday! Stop back! I just want to thank EVERYONE who left a kind comment regarding the news that I made Kristina Werner's Top Ten!! Your words mean so much because I think the samples I saw this week were awesome. Her challenges really stretch people to think a little outside the box; I just love looking at them all!!! But I would not want to have to choose out of all those entries! Anyway, you are all winners in my book! And thank you also to those who have been subscribing!! It is so much fun to hear from you out there all over the stamping world! Thanks again & bless you! I realized as I walked through my living room an hour or so ago, and saw it sitting in its place of honor on my piano, that I mixed the two cards up! (The other card was from Denise--they both are such awesome stampers that , oh well, you get the picture!) It uses that beautiful butterfly paper, a CHOCOLATE-embossed butterfly and some oh-so-pretty butterfly punch-outs!!! And she used the sketch challenge from this week and tied it all up with some taffeta ribbon. I am so lucky! Plus, she sent me some adorable kitten images--she must know that I didn't have any of them, since I didn't have any dog ones either!! She knows me so well! Just such a gorgeous card. Thanks, Wendy. You should check out her blog here to see all the wonderful things she has made! Isn't this sweet? She did such a GREAT job with making this card--I love it when customers send me one of their cards, it is such a nice feeling! We all got some of this beautiful butterfly paper on our recent shopping trip and I haven't used it yet!! I promise I will, there are just so many sets/papers/ideas, I need more time in the day!!!! The image is colored with an aquapainter & inks, then I masked it and stamped the background with Linen in More Mustard. I didn't get quite the effect I wanted, but I think it is okay. I mounted it on a piece of Always Artichoke, added some photo corners & brads, and then stamped the sentiment from my new Verve Petals & Stems with craft Chocolate Chip ink on some wide twill ribbon. Thanks for visiting today! This card is for two challenges--I just feel like I HAVE to do these, and I know I don't, in fact, I need to concentrate on my two events coming up quickly, plus convention!!! Yikes! Anyway, Our Creative Corner had a beautiful challenge, and the Inspiration Challenge yesterday was from this incredible Cupcake website here. The cake is chose is called Paisley. The website scrolls, so you can just look at all the cakes until that one comes up! You definitely need to browse this website....there are creations here you could never imagine. And if you want to buy a franchise, it is only $500,000!!! Let's run right out & get one! Anyway, here is my card, combining the two. I used the Paisley background stamp on Naturals Cream cardstock, stamped & embossed with white craft ink and white embossing powder. Just to add a little yellow to follow OCCC's inspiration, I sponged Barely Banana all over the embossing. I dyed a Pretties flower with Regal Rose ink, added a little bridal flower & rhinestone and mounted it on some wide Regal Rose satin ribbon. The little sentiment is from Papertrey's Mixed Messages, punched with the small oval punch and sponged with a little Barely Banana. The whole shebang is mounted on a Barely Banana card. I don't know anybody getting married, but I guess maybe I will someday and can use this card then!!! We are allowed to use three layers, and I only used one brad and a tiny little bit of glitter on the sand!!! It is difficult to see, but shells & seagulls are stamped on the background, as well as some clouds sponged on the sky. If you click on the picture, you can see it much better! Thanks for looking and make sure you thank someone for something today!! Better yet, send them a card & put it on SCS! I usually miss Kristina's color challenge---by the time I remember to look for it, it's usually too late!! Yesterday, I remembered; I was even up til 1 am last night waiting, but finally had to go to bed!! Don't these colors just give you a little hint of fall? Her style is a little edgier & hip than mine, but clean & simple, which I sometimes try to do, so here's my take. This card is 4 1/4" square; the flowers are embossed & punched out. I probably cased this somewhere, I am not sure, so thank you to whoever you are, if anyone knows, leave me a post! Of course, Kristina's work is PERFECT, and my sample has a couple little smudges of white EP which I could not get off, but I'm giving it a shot anyway! Thanks for visiting! Not sure when I'll get to stamp today, as my garden is overflowing!!! I wish I could send some zucchini through the airwaves to everyone that said they'd love to have some! I stamped some "way to go" cards for the top sellers in my Wee-inkers group for May (now it's time for June's already) and I wanted to post them now that I am sure they've received them! I usually try to make them fairly simple, and easy-to-duplicate, so they can use them as samples when they have workshops. I don't use this Crab & Co set often enough, so I thought by using one element, the starfish, they would be easy to make! The image is stamped in Stazon, colored with markers and embellished with some DD glitter. I mounted them off-center on a larger punched-out circle and added some taupe ribbon--love that stuff! Hope you enjoy them! The next card was for my cyber-friend Jodi, who just moved into her new home in England. I had fun making this card!! Everything was watercolored with an aquapainter & reinkers; the clouds were just a little post-it note cut into a cloud shape, then sponged with a dauber randomly around the sky. With this DP, I just think it is a bright cheerful card, and she told me she loved it! Hope you enjoy your day; it is beautiful, clear & non-humid today in SE PA!